Five Finger Death Punch have teamed up with Queen's Brian May, Kenny Wayne Shepherd and Brantley Gilbert in a video for new single Blue On Black. The song originally appeared on Shepherd’s 1997 album Trouble Is… and was covered by Five Finger Death Punch on last year’s And Justice For None album. The artists are donating all proceeds from sales of the single to the Gary Sinise Foundation. 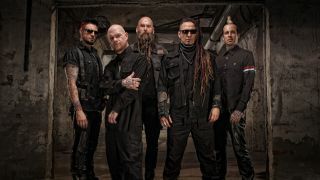 5FDP guitarist Zoltan Bathory explains: “To raise awareness for and support first responders is a cause that’s always been close to our hearts. “These brave men and women leave their homes every morning not knowing if they’ll ever see their families again. Yet they make a conscious choice to do so for the greater good. The video for Blue On Black can be watched below and the track is now available to buy across various platforms.